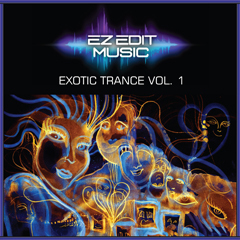 EXOTIC TRANCE VOL. 1 – Welcome to EZ Edit Music ! This collection is comprised of music loops that are useful for content that has an exotic or tropical flavor with ethnic percussion and an ambient mood. "Bazaar Mood" Stereo-mix plus stems. "Flying In My Sleep" Stereo-mix plus stems. "Coastal Karma" Stereo-mix plus stems. "The Path Is True" Stereo-mix plus stems. "Follow The Moon" Stereo-mix plus stems. "Border Crossing" Stereo-mix plus stems. "Warm Rain" Stereo-mix plus stems. "Rhythm Of Friendship" Stereo-mix plus stems. "Casbah At Midnight" Stereo-mix plus stems. "Finish My Thought" Stereo-mix plus stems.